Fishing is big in Swain County. So big, in fact, that it now has its own website – GreatSmokiesFishing.com. 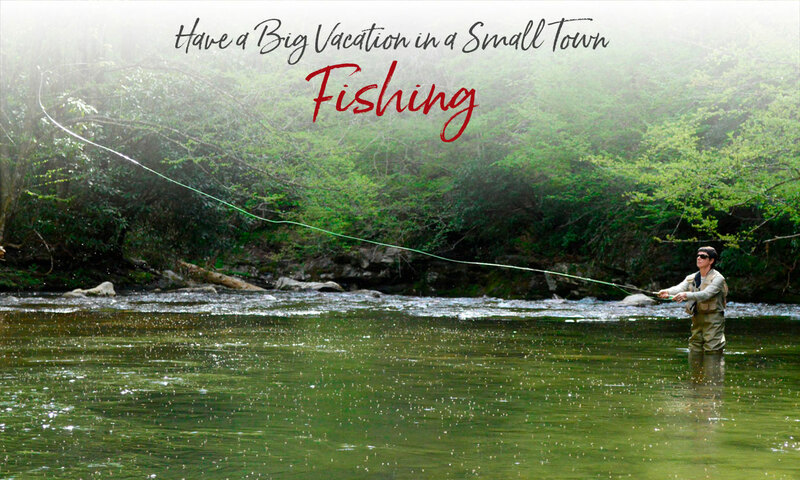 This comprehensive guide to fishing in the NC Smokies features, regulations, tournaments, guides, marinas and public access locations and a map and descriptions of twenty-six fishing destinations — mountain trout streams, creeks, rivers and two large lakes. These waters offer more than 17 sporting species from trout to to bass to muskie. What do you want to catch today? Whether you are fly fishing for native brook trout in a cold mountain stream, smallmouth or largemouth bass in beautiful Fontana Lake or rainbow or brown trout in one of the many stocked streams or rivers, Swain County hosts one of the most diverse fishing habitats in the world. The Great Smoky Mountains National Park and the Nantahala National Forest offer hundreds of miles of spectacularly clear streams. Just a few minutes from Bryson City, the sparkling waters of Deep Creek are ripe for fly fishing, and many anglers enjoy the Nantahala River just west of town, particularly the section above the powerhouse on Wayah Road (pictured). The Little Tennessee River just west of Bryson City off the Needmore Road is a wide, cold, boulder-strewn river – perfect for smallmouth bass, brim, rock bass and muskie. 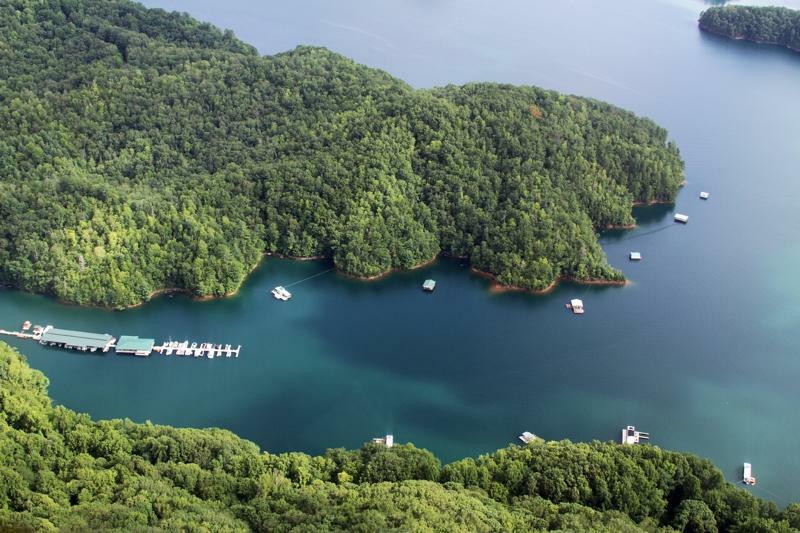 If you prefer flat water fishing, Fontana Lake boasts one of the most diverse fish populations anywhere in the country. With depths of over 400 feet, many northern fish such as walleye, muskie and smallmouth bass are among favorites of local fishermen. 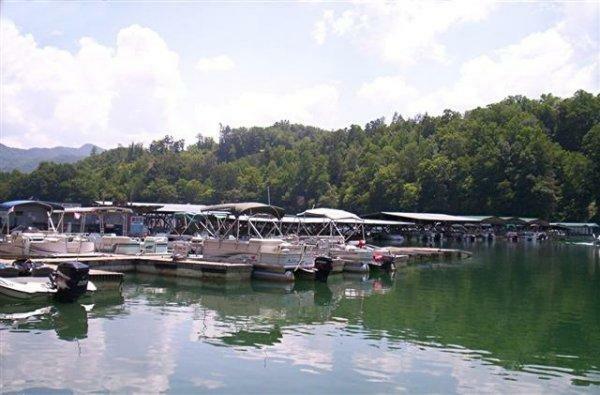 For boating information, including public boating access and marinas with boat rentals, as well as the Old 288 handicap accessible fishing pier, visit the Boating page of this web site. Below Fontana Dam on Highway 28, the Lewellyn Branch handicap accessible bank fishing pier and boat launch ramp facility offer fishermen access to Cheoah Lake on the Little Tennessee River. More fun activities on the water near Bryson City. Specializing in fishing the waters of Western North Carolina. We offer fly fishing trips for the beginner to the expert level fisherman on all the most popular streams. Wade or float trips are offered for full or half day with lunch included. Let us help you plan the trip of your dreams. All equipment provided. Camping Cabins available. 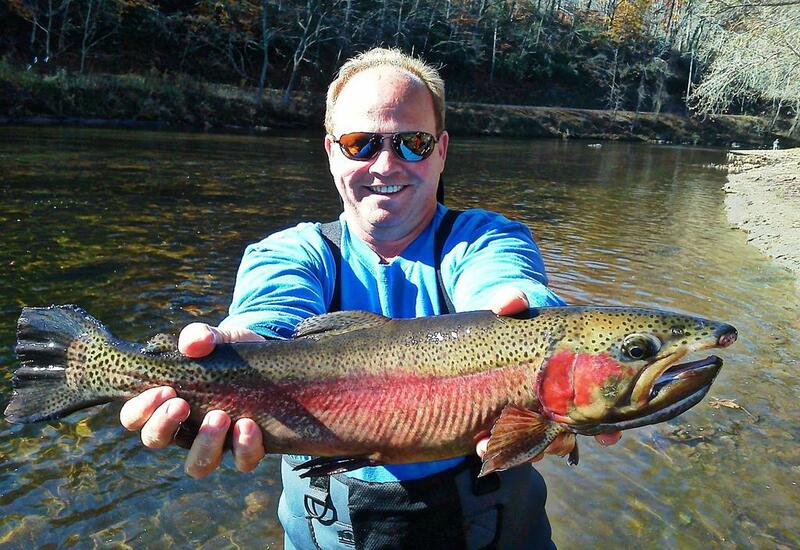 Nantahala On The Fly is a Carolina Outfitters, Inc. Company licensed by the US Forest Service. Bryson City NC's only full service fly shop! We are your headquarters for local fly patterns, fly fishing gear, guided trips, and fly fishing advice. We carry products from many well known vendors such as Redington, Rio, Catch Fly Fishing, Montana Fly Company, Scientific Angler, Umpqua, TFO Fly Rods, Chota, Brodin Nets, Simms Logo Apparel, and our very own Tuckaseegee Fly Shop logo hats and shirts. We welcome all locals and travelers to stop in and say hi! Address: 2013 East Fork Rd. Complete fishing guide service. Specializing in area lakes for Bass, Walleye and Trout. Thirty years experience at Fontana Lake. Can take anyone from novice to expert. We provide all bait, tackle, lunch, drinks and snacks. Top of the line equipment, Lowrance Units, Minn Kota, Penn, Abu Garcia, 22' Panga CC w/145 Yamaha. USCG Licensed. Endless River Adventures offers full and half-day fly fishing adventures for both beginning and experienced anglers. Options include float trips on the Nantahala River, as well as wade trips on the Upper Nantahala for trout; float and wade trips on the Tuckasegee River and Little Tennessee River for trout and small mouth bass. All equipment, rods, reels, waders and wading boots are included. Over 20 years experience in Western North Carolina. Licensed by the US Forest Service. Complete fly fishing shop. With over 20 years in the guide industry, Smoky Mountain Adventures specializes in creating a memorable fishing experience. Whether it's backcountry camping & fishing for wild trout, or a day trip learning the art of fly fishing, we have the expertise & patience to give you a trip you will remember for a lifetime. We offer half-day, full-day, & multi-day trips on all area streams, rivers & lakes to fish for trout, walleye, smallmouth & largemouth. Let us customize an unforgettable trip for you! We offer fly fishing, spin fishing and lake fishing. We specialize in catching Bass and Walleye on Fontana Lake and catching Rainbow and Brown Trout on Cheoah Lake. We also catch Steelhead Trout on Santeetlah Lake. All bait and equipment is furnished. A shore lunch is provided for full-day trips. Half day trips are also available. Open year round. 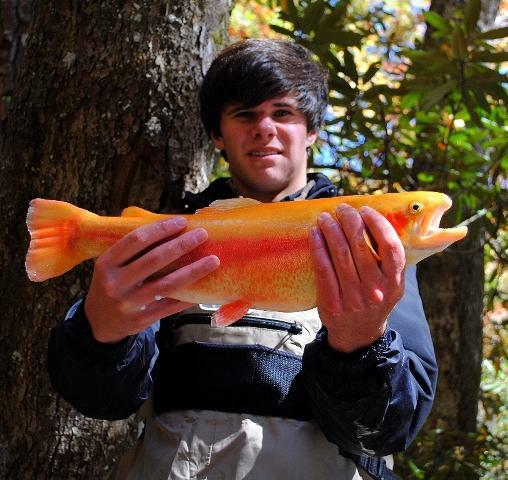 We'll show you the best fishing in the rivers & lakes of the Smoky Mountains. Fish with International Game Fish Association Professional Guides. Half day & full day trips. Pontoon boat, kayak & paddle board, wade & walk, and night fishing trips offered year round. Choose fly fishing or spinning tackle with top of the line gear. We provide everything. We have a trip for any skill level or budget. HD photos & videos of your trip available upon request. Ask about our lodging packages. A premier guide service located in the beautiful Smoky mountains of Western NC - the most picturesque trout waters east of the Mississippi River. We accommodate the serious angler as well as the beginner. 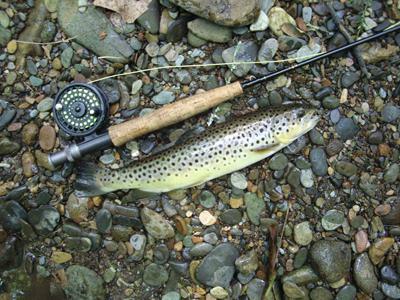 Learn when and where to catch trout while taking in the soothing waters of Western NC. We are committed to making this your best experience on the water. Full service fly fishing shop fully stocked with all your fly fishing essentials, basic spinner fishing gear and bait, and hiking and camping gear. Also offering fully guided fishing and hiking trips throughout Cherokee, Bryson City, and the Great Smoky Mountains National Park. Convenient location with onsite parking near the entrance to the Great Smoky Mountains National Park. Do you want to book adventures like Fishing plus multiple other Adventures while you’re here for vacation? Save time making reservations and do it all at one website! Our adventure planning and reservation concierge service consolidates your vacation research and planning in one place. Visit our website, choose your desired adventures like Fishing and we’ll make the reservations plus set up your itinerary! Fly fishing outfitter for guide and float trips, schools and casting instruction since 1987. We are a licensed fishing guide service with over 25 years of guide experience. We are available for 8, 6, and 4-hour fishing excursions for up to 4 people maximum per trip, 7 days a week, year-round. Call us for more information on available times and for reservations and scheduling information. Fly Shop & Guide Service. Discover the majestic streams and mountains while enjoying a day of guided fly fishing with some of the Great Smoky Mountains best fly fishing guides. Since 1999, we have guided anglers of all ages and skill levels to some of the most beautiful trout streams in all of the southeastern United States. We offer wade trips, float trips, our signature beginner classes, backcountry camping and the option of half-day and full-day trips. We have something for everyone and for every budget. Our Fly Shop in downtown Bryson City is stocked with everything you need for a great time fishing in the Smoky Mountains. Stop by and check us out.